Good news! Thanks to our fan STN, all recordings on this site are now in mp3 format so you no longer need any special software to play them. Any modern web browser should stream the recording when you click on its name. To download a recording file, right click on its name and there should be a Save or Download option. All recordings on this page are copyrighted by their respective authors. Scroll down past the list of recordings for an explanation of what this is all about. I ran a telephone line for many years where the public could dial in and listen to recordings, which I would change every few days. Sometimes I would play phone trip recordings like the above, sometimes educational lectures, sometimes skits that my friends and I would create, sometimes excerpts from commercial humor records. The following are samples. Me and my friends weren't the only ones who went on phone trips. Here's another recording with telephone sounds from the Seattle area, and also recordings from Great Britain. Andrew Emmerson from London corresponded with someone in Seattle 30 years ago and they mailed tapes to each other with narrated telephone sounds from their respective cities. Here is the tape he received from the guy in Seattle, but he forgot the name. If anyone can identify this voice, please send email and let me know. Following that is Andrew's tape. Phone Tripper and phone phreak Evan Doorbell tells the story about how he got interested in phones and recording phone sounds. The following recordings of phone trips and switching sounds were contributed by Evan Doorbell. He has many more, and I hope to have some of them on here shortly. Evan Doorbell was a member of Group Bell. 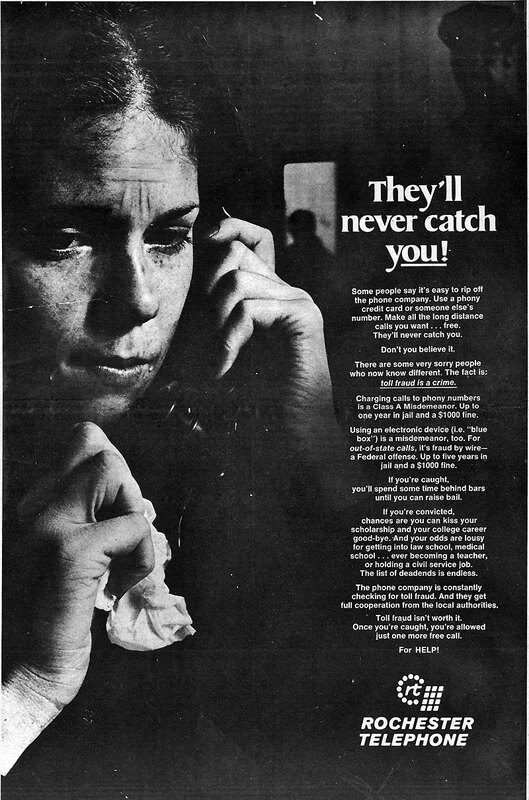 They made the famous "Dom Tuffy" tapes in 1973, based upon a real telco security agent they had encountered: Tom Duffy. They decided that in retrospect the real Mr. Tuffy was a decent guy who was just doing his job. He wasn't out to ruin anyone's life; he just wanted the phone company to get its "revenue", about which he was genuinely enthusiastic. Here is a recording made in 1972 of a phone conversation between the young Evan Doorbell and the real Tom Duffy, with a narration before and after explaining why the Dom Tuffy recordings were made. Group Bell made other entertainment tapes; here are two samples. Phone Tripper Frank Wilsey visited the Vintage Telephone Equipment Museum in Seattle, WA and the New England Museum of Telephony in North Ellsworth, Maine. Both museums have complete, fully-restored, fully-functional, electromechanical switching machines just like the ones you hear in the phonetrip tapes above. You really must visit them to see and use the equipment instead of just listening to old tapes. Frank made tapes on the history of telephone switching using sounds he recorded inside the museums as examples. Phone tripper Joseph G. Molter (aka JeepMan), email jmolter@sbcglobal.net, took a trip to La Crosse, IN and made a recording from a payphone and from inside the switchroom. Phone tripper Trace McCall sent us a recording he made inside a step by step central office, and he promised to send us more. The pulse repeating followed by the loud chattering was a CAMA trunk MF sending to the Frederick Tandem office. At the beginning of the segment, in the background you can make out a "snoring" sound. That's a linefinder group running a switchman-started test. Phone tripper Mike Tate visited a United Telephone payphone in Winter Park, FL, on the night when their NX1 switch was being replaced with a Northern Telecom DMS100 switch. He made two recordings documenting this event. The first is playing around dialing various numbers with the NX1. The second starts with a reorder (fast busy) signal coming from the NX1. He let the busy signal go until the switch was taken out of service and the tape rolls until the new switch gives the dial tone. Mike says that the DMS 100 is still in service. The following are other people's telephone recordings that I dialed and recorded at various times. The following is an episode of the old TV show The Rockford Files. Watch it until at least a little over 10 minutes and trust me, you will be amazed, unless you already know about this, because it it fairly well known. OK, so what are these recordings all about? Why are they here? Greetings fellow web trippers, my phone phreak handle is Mark Bernay and 35 years ago I used to go on phone trips. 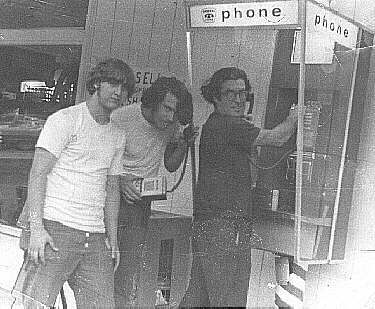 Yes, it's true: just like the people in the picture at the top, I would drive around to small towns primarily for the purpose of playing with their payphones. I often brought along my trusty Craig 212 portable 3-inch reel-to-reel tape recorder (this was before cassettes were popular) to record the phone noises and narrate information about them for my friends. I don't go on phone trips anymore and you are probably thinking that this is because I grew up, but no, I never did. The reason I stopped phone tripping is that all phones are about the same all over the country nowadays and they are really boring. 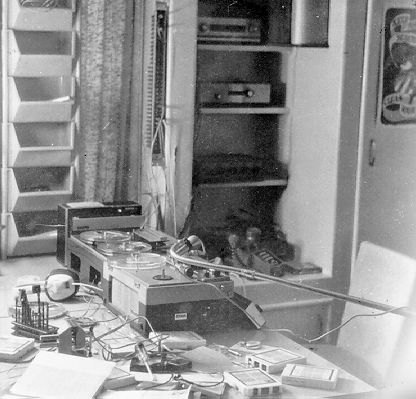 This picture shows my recording equipment around 1968, which I used to edit these tapes and prepare them for playing on a public phone number. My current desk is just as messy, but with PC's instead of reel-to-reel tape recorders. I first started playing with phones -- not talking on them, but playing with the switching systems and the network -- when I was a teenager growing up in Los Angeles. My family moved from Pacific Telephone (now Pacific Bell) territory to General Telephone. I noticed big differences in the noises the phone made as the dial tone came on, in between digits as numbers were dialed, after dialing and the call was switching through, etc. I did a lot of reading about telephone switching systems and visited many phone company switchrooms to learn what was going on. Unfortunately I wasn't into photography at the time these tapes were made and I have no pictures of myself on a phone trip. I got the photo at the top from a friend who also went on phone trips, but none of the people in that picture took part in these recordings. The gentleman at the payphone is famous and you probably heard of him. There have been 881090 accesses to this page.